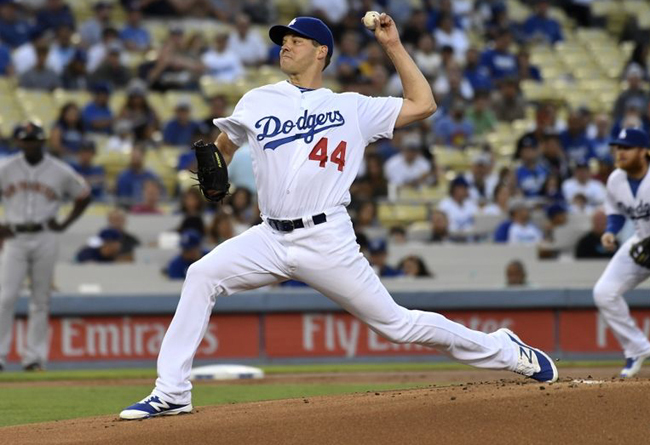 (Central Islip, N.Y., Dec. 6, 2016) – Former Long Island Ducks left-handed pitcher Rich Hill has signed a three-year, $48 million contract with the Los Angeles Dodgers on Monday. In doing so, he joined lefty pitcher Scott Kazmir (Sugar Land Skeeters, 2012) for the largest Major League contract signed by a former Atlantic Leaguer. Kazmir also signed a three-year, $48 million deal with the Dodgers in December of 2015. Hill’s deal comes following an incredible 2016 season. In 20 starts with the Oakland Athletics and Dodgers, he compiled a 12-5 record with a 2.12 ERA and 129 strikeouts to just 33 walks in 110 and one-third innings pitched. The southpaw’s year included a start on Opening Day for Oakland and the American League Pitcher of the Month award for May when he was 5-1 with a 2.13 ERA and 37 strikeouts in six starts. He also threw seven perfect innings on September 10 against the Miami Marlins before being removed from the game by manager Dave Roberts. The 36-year-old went on to pitch for the Dodgers in the postseason. In three starts, he posted a 1-1 record with a 3.46 ERA and 19 strikeouts over 13 innings of work. Hill started the decisive Game Five of the National League Division Series, which the Dodgers won, 4-3, over the Washington Nationals. He then went on to pitch six innings of two-hit, shutout baseball in a 6-0 win over the Chicago Cubs in Game Three of the National League Championship Series. Hill’s magical journey back to the Major Leagues began in Central Islip in 2015. After signing with the Ducks on July 28, he turned in two tremendous outings. In 11 scoreless innings of work, Hill yielded just two hits and three walks while striking out 21 batters, including a franchise record-tying 14 on August 9 against the Camden Riversharks. The following day, his contract was purchased by the Boston Red Sox. The Boston native went on to make five starts at Triple-A Pawtucket before he was promoted to the Major Leagues on September 8, less than a month after pitching for the Flock. Hill would make four starts for Boston and went 2-1 with a 1.55 ERA and 36 strikeouts to just five walks in 29 innings. In 17 seasons, the Ducks have seen 15 players reach the game’s highest level after playing for Long Island. The list includes Carlos Baerga, Pedro Borbon Jr., Bill Pulsipher, Ken Ray, Nelson Figueroa, Mel Stocker, Jay Gibbons, Erick Almonte, Robinson Cancel, Joey Gathright, Justin Hampson, Kip Wells, Lew Ford, Scott Rice and Hill. In 2016, five members of the Ducks had their contracts purchased by Major League organizations. Among them were Bruce Kern (Royals), Nate Freiman (Red Sox), Mark Blackmar (Nationals), Jack Snodgrass (Rangers) and Eury De La Rosa (Astros).